This is really an article about compound interest. Maybe you've heard of it? It's that neat little thing that causes long-term investment to turn into astonishing amounts of money a few years after you will have likely died because you failed to start saving to invest soon enough in life. Yeah, that. It's the bedrock of most books on personal finance advice. It would be hard to imagine one that didn't mention it. Start investing now, later on you'll be rich, the logic goes. The cold, hard, unvarnished reality is that most adult video chat models won't make enough money to actually legitimately retire, as we'll see in this article. But that's OK. Not every job/gig you do in life needs to pay you enough to never have to work again. But the truth is, some models could achieve that over a 10-year career with careful planning and an avoidance of BMWs. We're not saying people shouldn't buy BMWs! But if you decided to adopt the goal of making enough money as an adult video chat model to achieve real financial independence, it wouldn't be advisable in most cases. 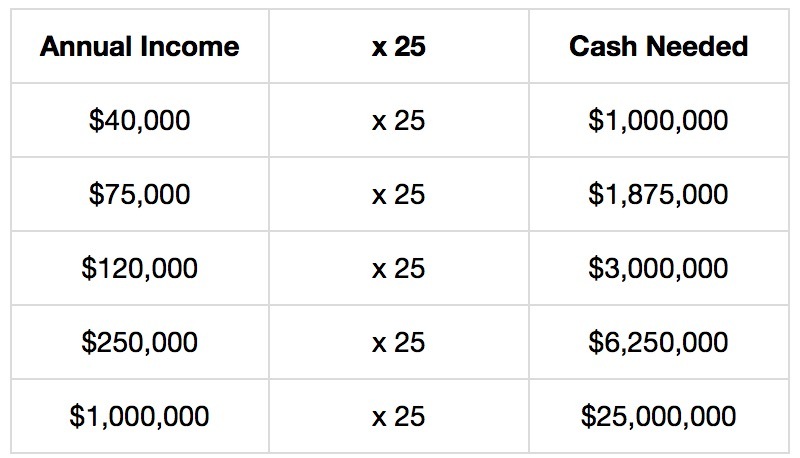 This is simply going to be a mathematical assessment of "how much cash you need" to effectively retire and never have to worry about making money again. That's achieved by taking a conservative interest rate that will yield enough interest income to cover your annual living expenses. For the purposes of this discussion, we're going to skip the nitty gritty details of balanced portfolios, stocks vs bonds, tax advantaged accounts, and the likes. Trust that those details are all solvable and any accountant or registered investment adviser can answer them for your situation in a one-hour meeting. Way too many people get bogged down in IRAs and give up before they set up an automatic savings transfer, don't be that person. Let's just do it. Any model that's actually engaged in the work can do a rough imagination of how many minutes in private that will take, assuming they save all of the money they ever earn on cam, and they can see that it's completely unrealistic. But then there's like.... a dozen or so? Who would go, "If I worked full time and kept up my stats, I could see making an extra million dollars over the next few years." So for those people. There you go. Those are the amounts. A few million and you can fly first class and stay in luxury hotels whenever you travel, eat at the world's best restaurants, and live in a very nice home. Since for most people numbers like this are so big that they make you panic and not want to think about it. "Let's get next month's rent paid and then we can talk about retirement, you condescending prick!" I get it. Hey, I'm the same way. So let's consider another rule that I came up with. We ALL understand $20. $20 is $20. That's a very solid drive-thru order. That's a week's worth of groceries in a pinch. That's 200 pop can deposits in the great state of Michigan! 200!!! So. How much money do you have to have stashed away in investments to make $20 per year? $500 is less than $1,000,000. By a considerable amount. $500 is an amount you can wrap your head around. $500 is an amount you can make in a day or two on cam. So do it, stash it away, and once per year treat yourself to an epic Taco Bell splurge, paid for by the interest earned from your portfolio. Spend 12-24 days straight hustling, stash the money, and you can be doing epic Taco Bell's once a month off of your interest income for the rest of your life. 6 weeks or so and you can do it weekly. Think about your fixed monthly expenses, the small ones. Phone bill, Netflix, Tinder Plus. These are all things you can knock out in short order. 50 days straight of $500/day and you'll have $1,000/year in income created. Do that 10x and you'll have $10,000/year in income. That's an $800/month apartment paid for perpetually. Perpetually is the interesting word and the thing you should think a lot about. That monthly Taco Bell trip isn't for the next year or two. It's every month, forever. When you die, your heirs will be able to keep going to Taco Bell every month to honor your memory. $6,000 sitting in an investment account pays for the monthly Taco Bell forever (and, by the way, the $6,000 stays in the investment account, you don't lose it). I find that exciting. Is earning passive interest income to be able to eat at Taco Bell once a month the most significant thing ever? No. But it's something. And recognizing that small attainable things do something makes the overall thought process a lot less intimidating. Or don't eat the Taco Bell. Just put the $6,000 away and let the interest keep going back into the account. Forget about it for 40 years and it'll be $44,000. That is 440,000 BOTTLE DEPOSITS! Maybe the best case scenario you can imagine from camming is walking away with $30-40,000 of hard earned money saved up by the time you're going to be finished. That's a significant amount of money to put away. That's a $20 bill 88 times per year. It would be cool if someone just handed you $20 88 times a year. Most people can make that happen. If you let that $40,000 sit until you're old it will be hundreds of thousands of dollars. Not enough to retire from, no. But you'll also have another 30-40 years of earning money in your career between now and then. So it could represent an extra $1,000/month in spending money when you're older. Putting away a five-figure sum in your 20s to grow in a retirement account puts you way ahead of where most people are at financially later in life. Far beyond the really cool financial effect this provides, there's a significant shift in mentality you'd go through if you did this. You'd see money differently. Your behavior would change. And you'd be significantly more likely to end up making a lot of it throughout your life than if you were to just spend everything you make as quickly as you make it, like most people. $20 is $20. But it might be even more than that if you open a Vanguard account.